Ah, the exclamation point, or exclamation mark as some call it… I believe it is seriously overused, and I like to think that most editors would agree with me. Don’t you hate reading a book where every piece of dialog ends in one? Commonly it us used to indicate a raised voice, shouting, surprise, alarm, etc. Lazy! (See what I did there?) As a writer, if you cannot show the reader a character’s emotions or tone of voice in any other way, then you aren’t being creative. Context should indicate whether they are whispering or shouting. All right, but where does it stop? Often I see double marks, e.g. “Stop it! !” So how do we interpret this? If one mark is shouting, what does two mean? Believe it or not I have read a published book (whose author shall remain nameless) who frequently used up to 5 (yes five!!!!!) exclamation points. Now we’re just getting silly. Some authors fall into grammar traps too, such as “What the hell are you doing here? !” I do believe those two punctuation marks should never appear together. 1. Overusing exclamation points in a vain and failing attempt to make your writing sound more exciting. Trying to put more “bang” in your prose, but looking instead like you have exclamation point diarrhea. My goal is to limit myself to one a page, and then only during intense dialog. I can happily go chapters at a time without using one. In the editing stage I search for them and play a game of seeing how many I can remove and still get the meaning across. Does this mean the reader has to work harder at understanding? Yes, but I don’t regard that as a bad thing, since your writing can be more nuanced without resorting to the loud “bang”. Avoid using them frequently, or they diminish in effect. Ask yourself whether the sentence is a true exclamation or is just a statement. In doubt err on the side of the period. If everything is emphasized, nothing is. What do you think? Am I being unfair to a perfectly acceptable element of punctuation. Please share your comments below. I am working on a customer’s system where the requirement is to store a lot of timeseries data from different sensors. Looking on these requirements I actually think that TokuDB might be a good fit for this task. There are several aspects to consider. 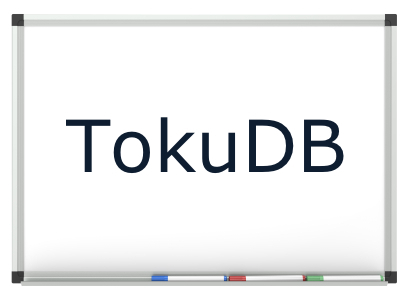 This time I want to compare TokuDB vs InnoDB on an initial load time and space consumption. where sensor_id is in a range from 1 to about 1000 and ts is monotonically increasing timestamp. This schema exploits both TokuDB and InnoDB clustering primary key, and all inserts are “almost” sequential, which guarantee that all inserts will not require disk access and work with data in memory. The same for SELECTS – select queries on the most recent time periods will be executed only by a memory access. I am doing this research on the Dell PowerEdge R420 box with 48GB of memory (40GB for InnoDB buffer pool size, and default memory allocation for TokuDB, which is 24GB for tokudb cache). The storage is a very fast PCI-e Flash card. So TokuDB is the obvious leader in both load time and compression. Of course just these are not enough, and now we need to see the performance of further INSERTs and SELECTs queries. This is what I am running right now and will post the results when I have them. 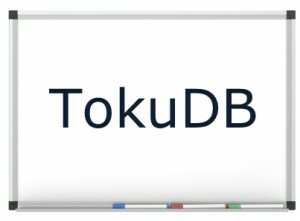 The post Considering TokuDB as an engine for timeseries data appeared first on MySQL Performance Blog. While working on the service architecture for one of our projects, I considered several SATA SSD options as the possible main storage for the data. The system will be quite write intensive, so the main interest is the write performance on capacities close to full-size storage. The devices are all attached to a LSI MegaRAID SAS 9260-4i raid controller with 512MB cache, and configured as individual RAID0 virtual devices. Testing workload is: random writes, 16KiB block size sending in 8 threads as asynchronous IO on ext4 file system. 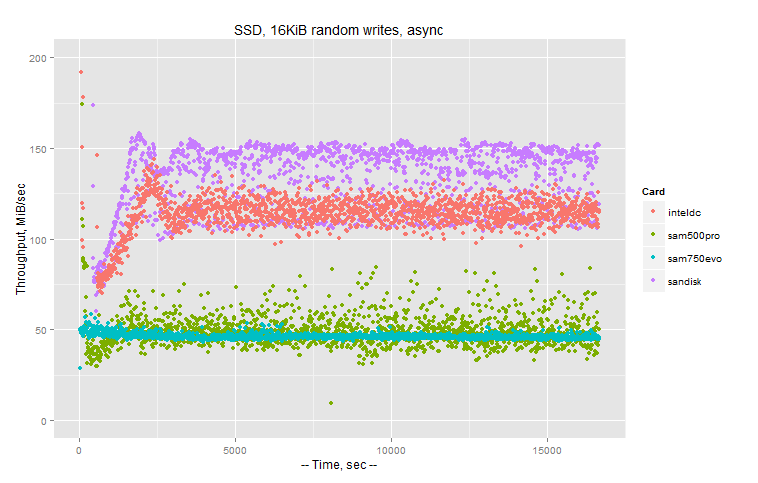 Asynchronous IO is used in the most recent MySQL/InnoDB and theoretically it shows the best possible throughput. So I am going to run further tests on Intel and SanDisk to find out which one is more suitable for our needs. 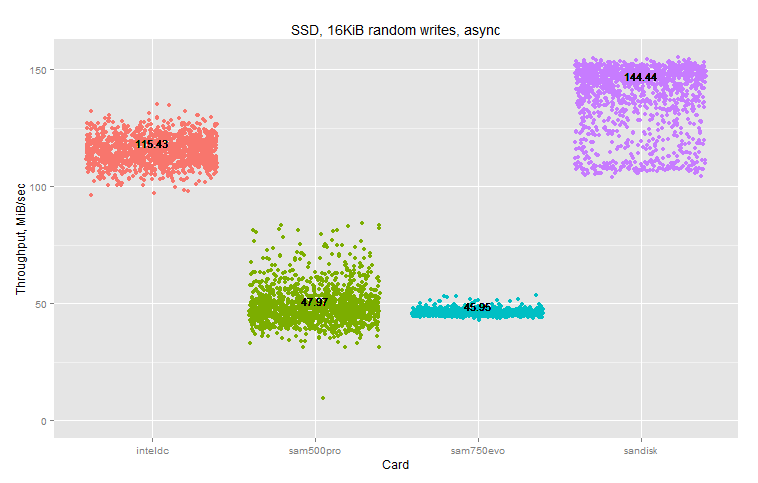 The post Testing Intel, Samsung & SanDisk SATA SSD appeared first on MySQL Performance Blog. What does Drupal do out of the box? Percona Server 5.1.71-14.9 is now available! Percona is glad to announce the release of Percona Server 5.1.71-14.9 on August 27th, 2013 (Downloads are available here and from the Percona Software Repositories). Based on MySQL 5.1.71, including all the bug fixes in it, Percona Server 5.1.71-14.9 is now the current stable release in the 5.1 series. All of Percona‘s software is open-source and free, all the details of the release can be found in the 5.1.71-14.9 milestone at Launchpad. The buffer pool mutex split patch implemented in Percona Server could cause a race condition, involving a dirty compressed page block for which there is an uncompressed page image in the buffer pool, that could lead to a server crash. Bug fixed #1086680. The buffer pool mutex split patch implemented in Percona Server could cause server crash with an assertion error on read-write workloads with compressed tables in debug builds. Bug fixed #1103850. If binary log was enabled, Fake Changes transactions were binlogged. This could lead to data corruption issues with deeper replication topologies. Bug fixed #1190580. Changes made to the RPM scripts for previous Percona Server version caused installer to fail if there were different datadir options in multiple configuration files. Bug fixed #1201036. Percona Server used to acquire the buffer pool LRU list mutex in the I/O completion routine, for the compressed page flush list flushes where it was not necessary. Bug fixed #1181269. Other bug fixes: bug fixed #1188162 and bug fixed #1203308. Release notes for Percona Server 5.1.71-14.9 are available in our online documentation. Bugs can be reported on the launchpad bug tracker. The post Percona Server 5.1.71-14.9 is now available! appeared first on MySQL Performance Blog. Percona is glad to announce the release of Percona Server 5.5.33-31.1 on August 27th, 2013 (Downloads are available here and from the Percona Software Repositories). Based on MySQL 5.5.33, including all the bug fixes in it, Percona Server 5.5.33-31.1 is now the current stable release in the 5.5 series. All of Percona‘s software is open-source and free, all the details of the release can be found in the 5.5.33-31.1 milestone at Launchpad. Percona Server shared-compat package was being built with the 5.1.66 version of the client, which didn’t work with OpenSSL. Fixed by building the shared-compat package with a more recent version. Bug fixed #1201393. Fixed the upstream bug #69639 which caused compile errors for Percona Server with DTrace version Sun D 1.11 provided by recent SmartOS versions.. Bug fixed #1196460. Fixed the regression introduced in Percona Server 5.5.32-31.0, where server wouldn’t be able to start if Atomic write support for Fusion-io devices was enabled. Bug fixed #1214735. Percona Server used to acquire the buffer pool LRU list mutex in the I/O completion routine for the compressed page flush list flushes where it was not necessary. Bug fixed #1181269. Other bugs fixed: bug fixed #1189743, bug fixed #1188162 and bug fixed #1203308. Release notes for Percona Server 5.5.33-31.1 are available in our online documentation. Bugs can be reported on the launchpad bug tracker. The post Percona Server 5.5.33-31.1 is now available appeared first on MySQL Performance Blog. Thanks to everyone who attended last week’s webinar on MySQL security; hopefully you’ve all gone out and set SELinux to enforcing mode if you weren’t already running that way. If you weren’t able to attend, the recording and slides are available for viewing/download. But now, without further ado, here are the questions which we didn’t have time to cover during the presentation. Q: Do you have a favorite software firewall you recommend that I can run on an EC2 instance in front of my MySQL server? A: I’d probably just do this with iptables. Any of the other Linux-based software firewall packages are all going to be wrappers around iptables anyway. However, if your MySQL server is already in EC2, you’re going to be better served by Amazon security groups as your front-line firewall. You can also run inside a VPC for some additional isolation. Q: What do you use for disk encryption in the cloud environment? A: I might use GPG if I need to encrypt specific files, or just encrypt data in the database via the MySQL functions or in my application, and there’s also no reason why you can’t use dm-crypt/LUKS in the cloud if you’re willing to accept that mounting the device will require some manual intervention, but for the most part, I think disk encryption for servers is pretty useless, because once you enter the key to unlock and mount the volume, anyone that can get access to that machine has full access to the data. I’ve heard of Gazzang being a possible solution here, but I’ve not personally looked at it, so I can’t speak to its performance or suitability. Q: How much overhead does SSL put on a heavily-loaded MySQL box? A: That depends on a lot of factors, such as the cipher in use and the kinds of load you’re running. The slowest part of SSL is the connection setup, so you’re going to see a lot less overhead for replication, connection pooling, or long-running transactions than you would from an application with rapidly connects to the database and then disconnects. There’s a graph on the yaSSL site which shows roughly a 25% penalty at 32 threads, but their benchmarks are from 2011 and they were run on someone’s laptop, so I have my doubts as to how well that translates to modern server-grade hardware. Q: Can MySQL do LDAP/Kerberos login? A: You can use the PAM authentication plugin (either the commercial one from Oracle or Percona’s open source version) to authenticate against an LDAP database. Thanks again for attending and submitting your questions; security is one of those massive topics where it’s only possible to scratch the surface in a one-hour webinar. Later this year I may do a follow-on presentation wherein we skip over all of the system/network/application details and do a deeper dive only on MySQL security-related tweaks and best/worst practices, so stay tuned! The post MySQL Security Webinar: Follow-up Q&A appeared first on MySQL Performance Blog. This is one of the most persistent myths I’ve seen in the field. It’s there for decades. If a myth is alive that long there must be some truth behind it. So, what could be bad about select *? Let’s have a closer look. Why is it bad to select all columns? In fact, there are a few very good reasons it is bad to select all columns if you don’t need them. And they all boil down to performance. What is surprising, however, is that the performance impact can be huge. Broadly speaking, the less columns you ask for, the less data must be loaded from disk when processing your query. However, this relationship is non-linear. Quite often, selecting from a table involves two steps: (1) use an index to find the address where the selected rows are stored; (2) load the selected rows from the table. Now imagine that you are just selecting columns that are present in the index. Why should the database still perform the second step? In fact, most databases don’t. They can process your query just with the information stored in the index—hence index-only scan. But why should an index-only scan be 100 times faster? Simple: an ideal index stores the selected rows next to each other. It’s not uncommon that each index page holds about 100 rows—a ballpark figure; it depends on the size of the indexed columns. Nonetheless, it means that one IO operation might fetch 100 rows. The table data, on the other hand, is not organized like that (exceptions). Here it is quite common that a page just contains one of the selected rows—along with many other rows that are of no interest for the particular query. So, the reason an Index-Only Scan can be 100 times faster is that an index access can easily deliver 100 rows per IO while the table access typically just fetches a few rows per IO. If you select a single column that’s not in the index, the database cannot do an index-only scan. If you select all columns, … , well I guess you know the answer. Further, some databases store large objects in a separate place (e.g., LOBs in Oracle). Accessing those causes an extra IO too. Although databases avoid to store the result in the server’s main memory—instead the deliver each row after loading and forget about it again—it is sometimes inevitable. Sorting, for example, needs to keep all rows—and all selected columns—in memory to do the job. Once again, the more columns you select, the more memory the database needs. In the worst case, the database might even need to do an external sort on disk. However, most database are extremely well tuned for this kind of workload. Although I’ve seen a sorting speed-up of factor two quite often—just by removing a few unused columns—I cannot remember having got more than factor five. However, it’s not just sorting, hash joins are rather sensitive to memory bloat too. Don’t know what that is? Please read this article. These are just the two top issues from database perspective. Remember that the client needs to process the data too—which might put a considerable load on garbage collection. Now that we have established a common understanding of why selecting everything is bad for performance, you may ask why it is listed as a myth? It’s because many people think the star is the bad thing. Further they believe they are not committing this crime because their ORM lists all columns by name anyway. In fact, the crime is to select all columns without thinking about it—and most ORMs readily commit this crime on behalf of their users. It’s not about the star, stupid! If you like my way to explain things, you’ll love SQL Performance Explained. Update 2013-11-03 – Is the star itself also bad? Besides the performance issues mentioned above that are not caused by the star (asterisk) itself, the star itself might still cause other trouble. E.g. with software that expects the columns in a specific order when you add or drop a column. However, from my observation I’d say these issues are rather well understood in the field and usually easily identify (software stops working) fixed. The focus of the article is on very subtle issues which are hardly understood, hard to find, and often even hard to fix (e.g. when using ORM tools). The main goal of this article is to stop people thinking about the star itself. Once people start to name the wanted columns explicitly to gain the performance benefit explained above, the issues caused by the star itself are also gone. Hence, I’ve felt no reason to add a discussion about these issues here—that’s just a distraction from the arguments that I wanted to explain with the article. Original title and author: “Myth: Select * is bad” by Markus Winand. One longstanding complaint I have heard for the past several years, and still hear today, is that Amazon’s Relational Database Service (RDS) does not allow the configuration flexibility as running MySQL in an ec2 instance. While true, this ignores the consistent work that Amazon has done to provide access to the most important configuration variables needed to tune a MySQL instance (after all, how relevant is it for a customer to set bind_address in an RDS instance). 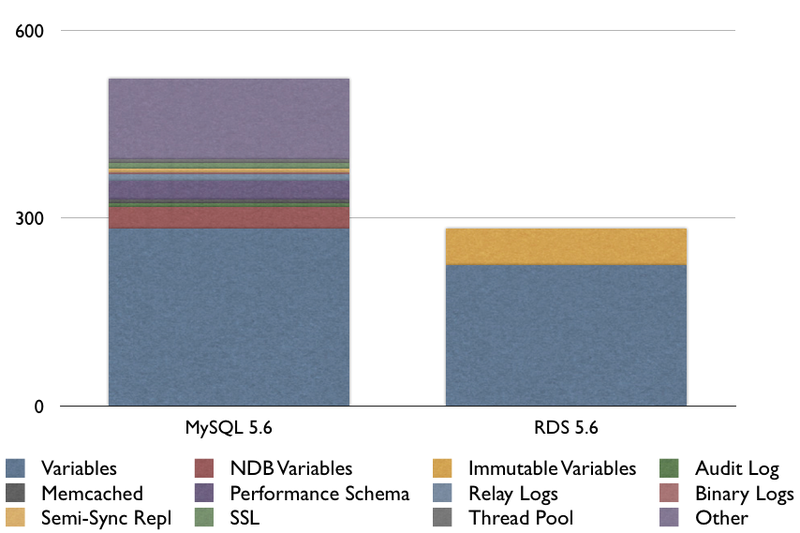 MySQL provides 523 options (35 of them NDB specific, so aren’t relevant to RDS), while RDS provides (via the web UI) 283, with 58 of those being immutable (things like basedir, datadir, and a variety of other variables). The Audit log PlugIn is a commercial extension not available in the MySQL Community Edition offered by Amazon, so it’s not relevant. The flexibility of controlling the maximum binary log size would be helpful in some workloads, but isn’t something that is generally tuned in the majority of engagements that I have been a part of. That these configuration parameters are not available via the Web UI is a bit of a misnomer. It is possible to enable/disable the Performance Schema and then control the collection via SQL as usual. Like the Binary Log settings, there is not much that we would want to tune here. The standard settings are appropriate for general workloads. Amazon RDS has a proprietary failover solution and block level replication across availability zones. It is not surprising that this functionality is not provided by default in the Web UI, but certainly something that could be useful for a small cross section of workloads. 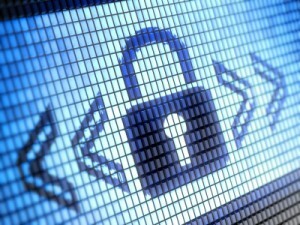 For companies with strict security needs, the lack of SSL may be a deal breaker for using RDS. But, depending upon the security policies in place, can be worked around by using Amazon’s VPC with SSL. For many companies, though, this may not play a role in the decision process. I find it hard to believe that, with Amazon’s resources, providing this is an insurmountable technical challenge. Perhaps we’ll see this becoming available in future RDS releases. The Thread Pool PlugIn is a commercial extension not available in the Community Edition of MySQL, so is not relevant to what RDS provides. There are, however, solutions in both Percona Server and MariaDB that Amazon may choose to port in the future. Amazon still has a ways to go to be fully compatible with configuration variables, but by and large the important ones are available to customers, with minor exception (I’m looking at you, innodb_log_file_size). 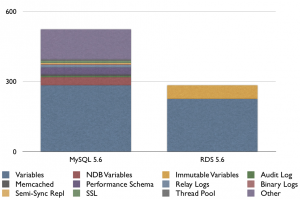 The post Amazon RDS with MySQL 5.6 – Configuration Variables appeared first on MySQL Performance Blog.